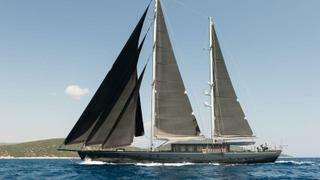 The 39.9 metre sailing yacht Rox Star has been listed for sale by Charles Crane at Engel & Volkers Yachting. Built in steel by Turkish yard Oguz Marin to RINA class, Rox Star was delivered in 2015 as a modern ketch-rigged sailing yacht. An interior by K Architectes accommodates 10 guests in five cabins laid out as a full beam master suite and four doubles, all with en suite facilities. A further three cabins sleep six crew aboard this yacht for sale. The main saloon has a bar area to port, with a large and comfortable corner sofa creating a welcoming and homely atmosphere. Guests can enjoy formal dining occasions here while experiencing a view of the starry night sky through the skylights above. The prominent wheelhouse makes for a grand and elegant interior meeting area, with large square windows adding copious levels of light to the warm and masculine decor used in this space. Further light comes from the oversized skylights that are framed by the prevailing use of dark walnut timber throughout the yacht’s interior. Under power, twin 560hp MAN diesel engines offer a cruising speed of 12 knots topping out at 15 knots.